Vietnam War scholar Edward Miller relived a dramatic moment in the war alongside veteran and then-Secretary of State John Kerry last month when they tracked down the site of a controversial 1969 Viet Cong ambush on U.S. Swift boats under Kerry’s command. In the closing days of the Obama administration, Kerry returned to Vietnam, where he had served as a Navy commander from 1968 to ’69. He was determined to find the site of a firefight in which he’d killed a Viet Cong soldier who was targeting U.S. Swift boats with a rocket launcher, ending the battle without American casualties. The action earned Kerry a Silver Star, but Kerry’s conduct came under political attacks during his 2004 presidential race against George W. Bush. Miller, whose work on the war includes cofounding the Dartmouth Vietnam Project, an oral history program focused on the war era, and serving as an adviser on documentarian Ken Burns’ upcoming film “Vietnam,” provided vintage maps and traveled with Kerry as he boated through Vietnam’s Mekong Delta in search of the battle site. The state department brought Miller in on the trip because of his reputation as a historian of the war, developed over 15 years of fieldwork in the Southeast Asian nation. 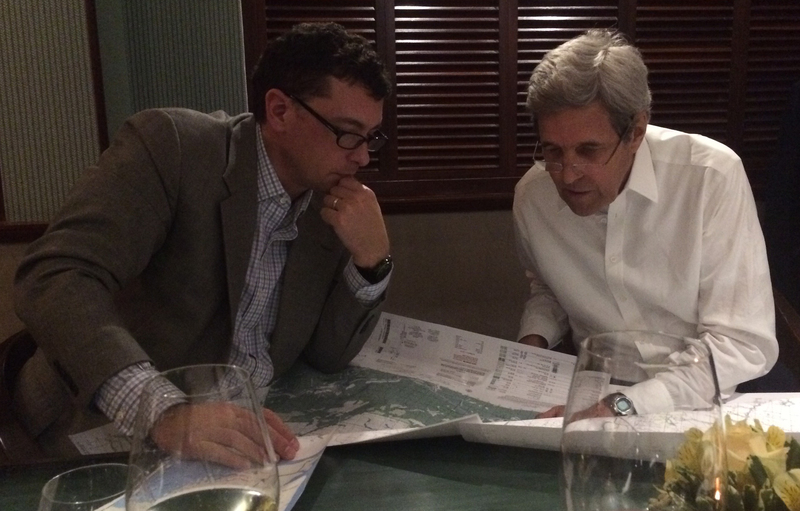 Miller met Kerry in Vietnam’s capital, Hanoi, and they pored over the reproductions of the 1960s U.S. Geological Survey maps, which the then-secretary of state said matched the charts he used back in 1969. For Miller, the most memorable moment came after they returned to shore and Kerry met a Viet Cong veteran who’d been involved in that 1969 attack. The two gripped hands for a long time as they spoke about that day 50 years ago, Miller said, and the former soldier told Kerry that the man he’d killed that day was a fighter in his 20s and the only member of the platoon trained in the use of a rocket launcher. During Kerry’s 2004 presidential campaign, detractors suggested that Kerry had killed an unarmed teenager in that battle rather than a soldier. The political attack ads from the period, which featured some American veterans known as “Swift Boat Veterans for Truth,” sought to undermine the narrative of the then-candidate as a decorated war hero. Miller’s scholarship on the Vietnam War includes his 2013 book Misalliance: Ngo Dinh Diem, the United States, and the Fate of South Vietnam, and has inspired an array of projects in Vietnam and at Dartmouth. He is advising Vietnamese museum curators in Ho Chi Minh City on an exhibition chronicling the social and political history of the war years; he co-teaches and leads a Tuck Global Insight Expedition (GIX) to Vietnam for MBA students; and he is working with Vietnamese and American colleagues to establish a new liberal arts university in Ho Chi Minh City. Miller’s Dartmouth Vietnam Project, co-founded with Jennifer Miller (no relation), trains Dartmouth students to document the memories of Dartmouth alumni and other members of the Dartmouth community about their experiences during the Vietnam War era. The goal is to show students that history is about human interactions and relationships, not just written records, Miller says. His interest in the history and culture of Vietnam deepened when he was a doctorate student writing his dissertation, which was subsequently published, on South Vietnamese President Ngo Dinh Diem, whose assassination in 1963 coincided with the escalation of the U.S. involvement in the war. Miller’s research led him to archives in Vietnam and elsewhere and broadened his perspective beyond the U.S.-centric understanding of the war. “Trying to convey that interest is a big part of what I do at Dartmouth—trying to share that inspiration with my students,” Miller said.